Clemson Girl: A spark is all it takes to start a fire. Clemson vs. Maryland game recap. A spark is all it takes to start a fire. Clemson vs. Maryland game recap. The Clemson Tigers got off to a sluggish start - down 18 points twice - in the second and third quarters during Saturday’s game at Byrd Stadium. All it took was one play - a Bashaud Breeland interception - to ignite the fire that is Clemson football. With the Maryland Terrapins well on their way to a route of the No. 8 Tigers, Breeland intercepted the ball and returned it 29 yards, giving Clemson new life and new confidence that would lead to a 56-45 victory and save their perfect season. 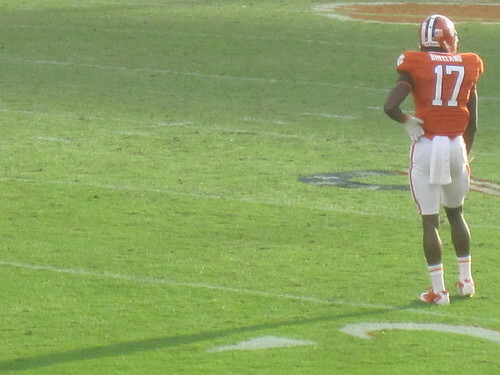 The Tigers began the game on the one-yard line after Sammy Watkins muffed the kickoff and was unable to get any sort of return. Clemson would ride the back of running back Andre Ellington 95 yards before stalling in the red zone, setting a Chandler Catanzaro field goal that put the Tigers up 3-0. The Clemson defense came out strong, stopping Maryland after a short drive. On the punt, Watkins appeared to have come in too far and had to field the punt over his shoulder causing a fumble that was recovered by the Terps setting up a quick seven-yard score putting Maryland ahead 7-3. On Clemson’s next possession, Tajh Boyd, who was apparently mentally rattled, threw a pass right into the arms of a Terrapin defensive back that was returned 40 plus yards giving Maryland a 14-3 lead. At halftime, Maryland led the Tigers 28-17. The second half began much like the first half ended. Maryland marched methodically down the field for a touchdown and Clemson punted on their first possession giving Maryland an 18 point lead. On the next Terrapin possession, Breeland provided the spark, intercepting a CJ Brown pass and returning it to the Maryland 15 yard line. Three plays later, Boyd would complete a pass to Watkins to make it a 35-24 game. Maryland and Clemson would swap field goals on their next possessions for a 38-27 score. Clemson’s run began with Boyd throwing for another touchdown, Watkins returning a kickoff 89 yards for a touchdown and Ellington scampering 44 yards for another score. The Clemson defense was able to stop Brown one final time to allow the Tigers to win the game on offense. Final Score: Clemson 56, Maryland 45.